We know that having an attractive, natural looking teeth help us look and feel our best. It gives us confidence inside and lets us enjoy the foods that we love. That is why the loss or damage of even a single tooth can have a considerable impact on a person’s everyday life and self esteem. It can change a person’s entire personality. How? Many people with missing teeth avoid smiling, which causes them to appear less friendly, grumpy and unhappy. Other than the aesthetic and psychological reasons , for health reasons, missing teeth should be replaced. Your teeth support and rely on each other. When one or more teeth are missing, the remaining teeth can shift out of their normal position, teeth in the opposing jaw can grow into the gap and teeth adjacent to the space or from the opposite jaw will often drift or tilt. These teeth are often more susceptible to decay and gum disease and they are more difficult to clean properly. 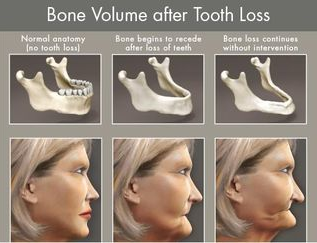 One missing tooth can ultimately lead to the loss of additional teeth and can change your facial appearance over time. Long term missing teeth also causes the bone to gradually break down. Of all ages, provided that jaw growth is complete. That has adequate jaw bone to allow placement and for good retention of the dental implant. If the bone volume is insufficient to support an implant, there are various ways of restoring the bone to prepare it for successful implantation. However, a small percentage of patients may not be suitable for dental implants for various reasons; a thorough assessment will be conducted on a case by case basis. Factors that may prevent some patients from suitability include alcoholism, diabetes, lack of adequate bone structure. What if I don’t have sufficient bone to place an implant? We offer bone grafting which is a procedure that replaces missing bone with a material called a bone graft. This material not only replaces missing bone, but also helps your body re-grow lost bone. This new bone growth strengthens the grafted area by forming a bridge between your existing bone and the graft. Over time the newly formed bone will replace much of the grafted material.Bone grafts are needed when a part of your jaw bone is missing adequate bone. This missing portion of bone is frequently called a “bony defect”. Examples of jaw bone defects are: defects surrounding roots of teeth with severe gum disease or defects which occur following tooth extraction; generalized decrease in quantity of jaw bone from trauma or long-term missing teeth.